With MPACaseMaker, BES-equipped agencies assess their PlayBook readiness by using the same in-vehicle peripherals to properly test and verify data access, run queries and input information, as well as perform license scanning and e-Ticketing in compliance with local courts and agencies. MPACaseMaker is a turnkey benchmarking kit which is easily shippable via courier, virtually indestructible, weighs under 20 pounds and contains a PlayBook with BlueTooth keyboard, license scanner, ticket printer and camera connected via USB SmartHub. 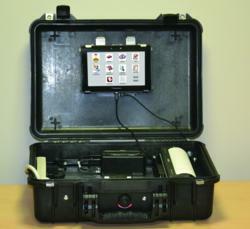 Once installed, the full MPA for PlayBook in-vehicle platform turns any police cruiser into a police station on wheels. Driven by widening demand from law enforcement agencies around the world for its MPA PlayBook 2.0 police apps, Mobile Innovations has built a case to help make its own case for cheaper, better and faster in-vehicle policing. Called MPACaseMaker, turnkey benchmarking kit is easily shippable via courier, virtually indestructible, weighs under 20 pounds and contains a PlayBook with BlueTooth keyboard, license scanner, ticket printer and camera connected via USB SmartHub. After a cross-country tour in a PlayBook-equipped Dodge Charger and subsequent appearance as the featured BlackBerry Alliance Partner at the International Association of Chiefs of Police Conference (IACP 2011) in Chicago, Mobile Innovations experienced a rapid hike in interest from distant locales such the Caribbean, Africa and Sweden. After witnessing the MPA In-Vehicle PlayBook 2.0 Platform working live during the tour or at the IACP Show, Police Services officials from outside North America began asking how Mobile Innovations' MPA for PlayBook 2.0 and BlackBerry would run in their jurisdictions. Attracted by the combination of security and functionality, at a price point eighty percent lower than a ruggedized laptop up-fit, they wanted a way to see MPA PlayBook working in their beats with their own IT. Supported remotely by the Mobile Innovations team, MPACaseMaker lets BlackBerry Enterprise Server (BES) users anywhere in the world accurately and cost-effectively bench test their vehicular IT requirements, without first having to invest in fully up-fitted cruisers. With MPACaseMaker, BES-equipped agencies assess their readiness by using the same in-vehicle peripherals to properly test and verify data access, run queries and input information, as well as perform license scanning and e-Ticketing in compliance with local courts and agencies. Once installed, the full MPA for PlayBook in-vehicle platform turns the police cruiser into a police station on wheels. Officers in the vehicle can securely access and search multiple police data bases, relay information about their position and status, securely email, SMS and send alerts, scan drivers licenses and print traffic tickets; they can also quickly complete activity and vehicle inspection reports. Mobile Innovations is a privately held company dedicated to enhancing law enforcement with the most advanced mobile data products available. Based in Niagara Falls, Canada, Mobile Innovations also has operations in Toronto and works with over fifty agencies across Canada, the United States and in the United Kingdom. Mobile Innovations is a member of the BlackBerry® Alliance Program with six years of service developing and deploying advanced mobile solutions for BlackBerry devices.